MEATWARE: the human element in a technological system. Here’s but a few links to some artists in NYC that have been embracing new technologies on the stage in the creation of their work. We’ll be adding more as time goes on. I’m sure that many of you reading this blog know of them, if not personally or as collaborators, but they are worth pointing out, especially if they are news to you. 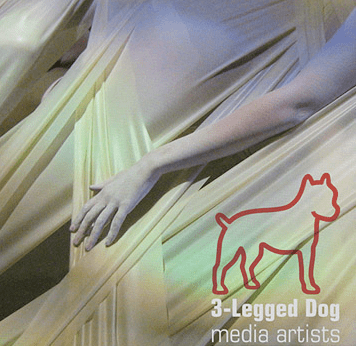 3-LEGGED DOG is a non-profit theater and media group focusing on large-scale experimental artwork. Their work has been seen in New York City at such venues as the Kitchen, La Mama, The Ontological-Hysteric Theater, PS 122, and Signature Theatre Co. Since 1994, they have become a mainstay in the experimental arts community and have been performing downtown ever since. Five years after the destruction of their headquarters at 30 West Broadway on September 11th, 2001, 3-Legged Dog Media and Theater Group announced the launch of a new home in Spring 2006. 3LD Art & Technology Center is located at 80 Greenwich Street in Lower Manhattan, just 3 blocks south of the WTC site. 3-Legged Dog is the first producing arts group to sign a lease in the Liberty Zone and the first to rebuild downtown. A cultural anchor for the Greenwich Street Arts Corridor, 3LD Art & Technology Center provides complete production and presentation facilities for emerging and established artists and organizations that create large-scale experimental works, many of which incorporate and create new tools and technologies. 3LD ART & TECHNOLOGY CENTER is a community-oriented and artist-run production development studio. They offer artists a unique experience with specialized equipment, flexible space and expert knowledge, as well as the desperately needed time to fully realize their visions. If New York City is to remain at the forefront of experimentation, then its artists must have the means to create cutting-edge work. Since opening in 2006, they have offered the latest materials and innovative tools to more than 900 artists from veterans like Laurie Anderson to the newest prodigies like J. Reid Farrington, recently of the Wooster Group. They have structured programs to ensure the aesthetic and financial success of their residents. They provide a critical resource and development home for these artists, who carry on the traditions of risk-taking and boundary-pushing aesthetics, a tradition that reaches back in New York City’s history to the late 1800s. TROIKA RANCH is the collaborative vision of artists Mark Coniglio and Dawn Stoppiello. Established in 1994, and based in New York City and Berlin, Germany, Troika Ranch produces live performances, interactive installations, and digital films, all of which combine traditional aspects of these forms with advanced technologies. The artists’ mission in producing this wide range of art experiences is to create artwork that best reflects and engages contemporary society. The name Troika Ranch refers to Coniglio and Stoppiello’s creative methodology, which involves a hybrid of three artistic disciplines, dance/theater/media (the Troika), in cooperative interaction (the Ranch). This method preceded the organization Troika Ranch, which was formed as a means to support the artists’ engagement in this process. During the 1990’s, Coniglio, Stoppiello and their company Troika Ranch were among the pioneers in the field that came to be known as Dance and Technology. As the use of technology in the arts has developed and integrated over the last decade, the need for the separate moniker Dance and Technology has dissolved. Troika Ranch’s present concerns correspondingly reflect this broader scope, expanding across genres and pioneering new frontiers. As innovators and visionaries, Coniglio and Stoppiello produce art that values live interaction – between viewer and viewed, performer and image, movement and sound, people and technology. It is time-based but typically includes an element of spontaneity, in that the events and images that unfold lie within a certain range but are not exactly replicable. As authors, they establish images, direct performances, determine time frames, and devise technologies. The works may be presented as performances, installations, or in portable formats. In sum, Troika Ranch engages in creative endeavors using all that contemporary invention has to offer. The arts world, well, the world in fact, recently suffered the loss of MERCE CUNNINGHAM. He extended the frontiers of choreography for more than half a century, most recently with his use of the computer program called DanceForms (formerly LifeForms). Former Cunningham performer, choreographer & media artist JONAH BOKAER seems to be the heir apparent to Cunningham and his use of technology in the creation of dance. Over the past several years, Jonah Bokaer has developed a body of work addressing the creative potential of digital technologies in movement production. He makes choreography by rendering a virtual body in the built domain, employing motion capture, digital animation, 3D modeling, and choreographic software to generate movement material. “Choreography” involves designing a body inscreen, embodying its movements in real time, and performing the choreography live. While developing this new artistic practice, Bokaer frequently questions (and subverts) the spaces in which works are performed, creating site-specific installations that playfully critique the venue presenting a dance. This generally involves a visual or sonic intervention in the periphery of each individual venue. As an arts activist, Bokaer is also deeply committed to fostering interdisciplinary dialogue with artists across media. With this in mind, he has established a cooperative studio space called “Chez Bushwick,” in which artists can congregate, develop ideas, and present their work in a catalytic environment. Bringing innovative new work into direct conversation with contemporary thought and culture is the main interest of this artist. Bokaer’s unparalleled dancing in Merce Cunningham’s company, his co-founding of the Brooklyn performance space Chez Bushwick, and his well-crafted yet cutting edge choreography that moves dance into the new century, have made him a convincing advocate for the dance community. CHEZ BUSHWICK, an artist-run organization based in Brooklyn, is dedicated to the advancement of interdisciplinary art and performance, with a strong focus on new choreography. Since its inception in 2002, the organization has been acknowledged as a new model for economic sustainability in the performing arts, offering New York City’s only $5 subsidy for rehearsal space, and thereby fostering the creation, development, and performance of new work. Chez Bushwick is also responsible for a number of monthly performance programs that encourage artistic freedom, collaboration, and creative risk-taking. This is just the tip of the iceberg and, even then, this is just one city. I’m very interested in where all this development is leading us. Personally, I feel that much of it still has far to go. As advanced as it may seem to us now, I still get that feeling that we’re like those folks who first marveled at the Model T.
Still, at this point, a it’s mighty gap to fill. This entry was posted in 1 - MUSIC, 2 - MISE-EN-SCENE, 3 - MOVEMENT, 4 - MONOGRAPHS, 5 - MONTAGE, 6 - MACHINES, 7 - MIXED MEDIA, 8 - MEMORY and tagged 3-Legged Dog, ableton, Chez Bushwick, Cycling '74, dance, DanceForms, Dawn Stoppiello, J. Reid Farrington, Jonah Bokaer, Kitchen, La Mama, Laurie Anderson, Mark Coniglio, MAX/MSP, meatware, Media, MERCE CUNNINGHAM, MMiX Festival, NYC, Ontological-Hysteric, PS 122, theater, Theaterlab, Troika Ranch, wetware. Bookmark the permalink.